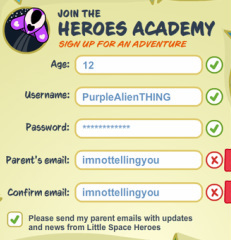 If you wanna join Space Heroes, you gotta know how to do it before you ACTUALLY make an account! Follow this step-by-step guide to making an AWESOME hero ready for adventure! 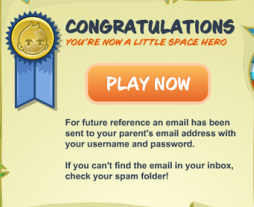 Go to spaceheroes.com and click PLAY FOR FREE. This will take you to another page where you can either click LOG IN or CREATE NEW HERO. Obviously, you click CREATE NEW HERO. The next thing you gotta do is choose a hero! Boy, girl or alien. I chose an alien! Then you need to customize your hero! Pick a colour for their suit, change their hair colour and NAME your hero. 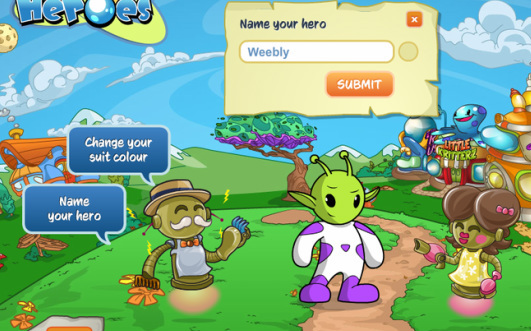 I named my hero WEEBLY. After you've chosen your hero and named it, click NEXT. This will take you to the terms and conditions page. 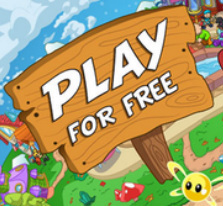 You have to accept the terms and conditions and the rules of play. And don't forget! CHOOSE YOUR CHAT OPTION. I chose Safe Chat. Here you have to enter your age, username, password and parent's email. MAKE SURE YOU HAVE PERMISSION FROM YOUR PARENTS TO USE THEIR EMAIL. Here you can ask your parents to check their email or you can just click PLAY NOW. Watch these videos to get you an even greater kick start!